I’m not afraid to admit it—I’m drawn to pretty things. I’ve struggled with the tug of materialism since childhood. Here, have a new [whatever], you’ll feel better. So when I went to India for this first time as part of my long-time-in-coming transition from over-educated, well-heeled young professional to over-educated, emerging-inner-hippie suburban yoga teacher, I fell in love with a set of mala beads because they brought out the color in my eyes. And because a wise man told me those were the right stones for me. And because it’s what yogis are supposed to buy in India. But when I held the cool beads in my hand, I felt a pulsing energy, something powerful and grounding. I was drawn to them. They represented for me the start of a long path to begin to fill a spiritual void that I had been carrying for many years, the genesis of my decision to travel to India in the first place. I have to admit, however, despite bringing home several sets of japa mala beads that I dipped in the healing waters of the river Ganges, I still have yet to settle into the daily mantra and meditation practice that I know is a vital part of my spiritual journey. But I am at peace with the fact that I will get there in my own time. And the beads still play a very important part of my practice of yoga, reminding me that this journey must start slow—one bead at a time. Right now, I’m engrossed in the practice of being present, not getting lost in the lure of every shiny object that floats by, not getting distracted by the inner critic that likes to remind me I’m a good-for-nothing yogi because I can’t manage to meditate and chant every morning. Mala beads took on a new meaning when I embarked on the Global Seva Challenge in collaboration with Off the Mat, Into the World, to raise funds and awareness for sustainable relief efforts in Haiti. This is another practice that for me has seriously tested my edge. I’m good at spending money and supporting other people’s causes. But I am challenged by asking for donations, by finding my voice to champion a cause I believe in. By connecting with others in a meaningful way rather than always choosing an easy yet sheltered road. And especially by not letting a big intention and a big goal—raising $20,000 for Haiti—make me feel small, doubting, and powerless. So, I decided to make malas. . . . Because I find something so powerful about a strand of 108 little beads hanging around my neck, whether I’m meditating with them or not. It reminds me to focus only on the present repetition instead of the 107 beads that lie ahead. To not let the big goal overshadow each tiny step to get there. Every mala that I sell, every small request that I make—asking a friend or a complete stranger to support my effort or buy a piece of jewelry—brings me one step further along on my journey. But the beads also help me remember to stay unattached to the material goal of the challenge and the dollar signs that go with it. It’s all about the journey, and it’s all about the intention: to serve, with no view towards the outcome, simply out of compassion and deep love. I am humbled by the innumerable gifts I have been given in this life and the opportunity to share them. As I travel simultaneously on my own inner spiritual journey and outwardly as a leader in this incredible effort for Haiti that is so much bigger than myself, I am learning about yoga in a way that I might not ever experience it on my mat. And for those who buy the malas I have lovingly made, one bead at a time, in a process that is itself much like a meditation, I hope they will find the same path to peace that I have. One bead at a time. Donations for To Haiti With Love and the Global Seva Challenge will support several incredible projects in Haiti. One is the Jacmel Children’s Center. In a rural community outside Port-Au-Prince, hundreds of children who were orphaned by the earthquake are living day-to-day, by the selfless service of local community leader, Bonite Affriany. “Mama Bonite,” as the children call her, feeds and educates more than 275 children everyday. Most importantly, she provides these children with love and support that many do not get anywhere else, but even so then they must return to their tents or the streets. Yogini and Off the Mat leader Lisa Rueff, along with her husband, are spearheading a project to build the Jacmel Children’s Center, a property that would house many of the children Mama Bonite cares for, as well as providing education, art opportunities, and refuge to many other children and serving as a gathering place for the community. That’s what the Seva Challenge is all about. Please support To Haiti With Love so the Jacmel Children’s Center can become a reality. Read about the other incredible partners and projects we are supporting. Yesterday I got together with my amazing partner in the Global Seva Challenge, Christy (www.christy4haiti.com), and the lovely Carol of Coco Yogini, to make malas. Christy and I decided that we would make handcrafted malas with a unique design that invokes Haiti and the seva challenge journey, as part of our fundraising efforts. They will be more meaningful than t-shirts or other products we could sell, especially because we’ll be making them ourselves. You can’t buy these beauties yet, but I wanted to give you a little preview of our mala-making adventure. Christy and I both consider ourselves to be pretty crafty, and I did quite a bit of jewelry-making and metalwork when I was younger, so I was thrilled to dive right in. Carol, who sells beautiful hand-knotted crystal and pearl malas online and in local boutiques, was kind enough to donate her time for the lesson. We worked hard, but had some laughs and a lovely time chatting and knotting, knotting and chatting. By the way, in case you aren’t familiar with malas, they are a form of prayer beads, used in yogic and Buddhist meditation practices to count repetitions of a mantra (a word or phrase that is repeated as part of the meditation). 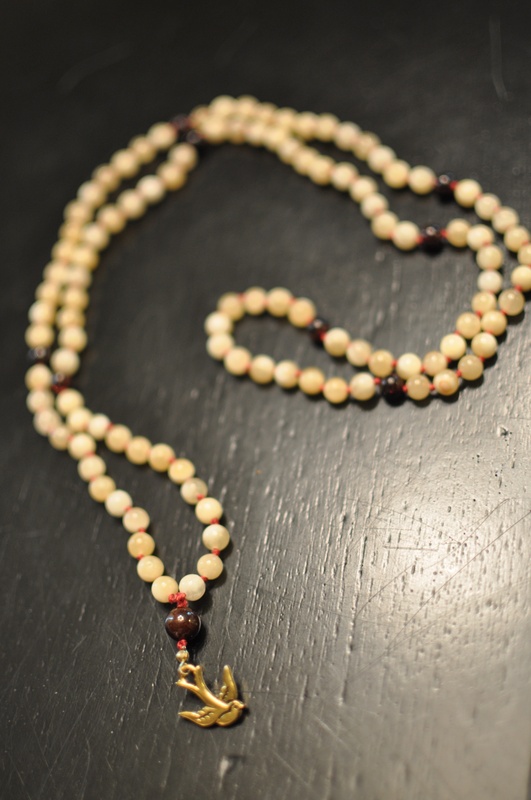 A traditional mala contains 108 beads, symbolizing a sacred number in Hindu spirituality. Check out this web site to learn more about malas and the meaning of 108. Malas also just make beautiful jewelry! Look for Malas for Haiti, coming soon to a web site or boutique near you!